Miss Piggy Finally Getting Married In The Muppets... Again! If you're a devoted Muppet fan, you might be upset by this headline. 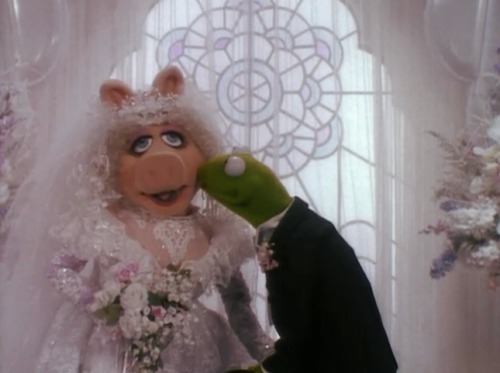 After all, didn't Kermit and Piggy wed at the end of Muppets Take Manhattan? It did seem so, but in the subsequent Muppet family movie Muppets In Space, it wasn't apparent that the marriage took. Then in 2011's The Muppets, Miss Piggy and Kermit had clearly split ways, with the former clearly jilted. Notably, whenever the pair has been interviewed, Kermit insists they are not married, though Piggy often disagrees. "I’m now at Pinewood doing the Muppet show, and today has been one of the best days of my life, designing Miss Piggy’s wedding at the Tower of London…I’ve never been so happy." As /Film's Angie Han points out, this news has been subtly hinted at in previous stills, since Piggy is sporting a seriously flashy diamond ring. We assume the ever-fashionable swine is marrying her long-time love, Kermit. (Anything else is unimaginable.) And it's fabulously fitting that Miss Piggy should get married in London, since it's the place she and Kermy fell in love circa The Great Muppet Caper. Since The Muppets…Again! centers on a cross-Europe road trip, littered with landmarks, this destination seems a great place for a set piece and a cavalcade of cameos. Perhaps John Cleese could reprise his role as the flustered gentleman Neville? Of course, the real question is how the art department will top Piggy's last wedding look. Real talk: I saw this in person at a Muppets museum exhibition, and wept in witness to it. There are big shoes to fill here. The Muppets…Again! will finally hit theaters on March 21st, 2014.